When you're ready to get a wall tent stove, you'll want to consider a few key factors--things like type of material your stove is made from, how portable you'll want your stove to be, and more. This quick-start guide will help you find the right stove for your wall or canvas tent, and will get you moving toward buying an item that can last you a lifetime, and create great memories for you, in years to come. 1. What type of material is best for your wall tent stove? A. Titanium: this is a great material to make lightweight tent stoves. Titanium stoves resist warping, are about 50% lighter than steel of the same guage. If you want a very portable stove, and weight is a consideration--then you'll want to look at titanium as your number one choice. B. Cold-rolled steel: a great balance of strength and weight, cold-rolled steel is the popular choice for camping stoves used for winter camping. 2. What about collapsible vs. non-collapsible stoves? Some stoves pack nearly flat and unfold to create a flimsy firebox, and stove...don't get this type of stove! The Four Dog Stove models are designed to balance portability with packability. You'll see that we design the stoves to have the legs, optional water jacket and stove pipe (in some models) pack right into the firebox. That way, all you have to carry is one item, which is the stove's firebox, with everything packed into it. 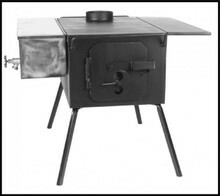 In nearly every case, you'll want a solid body firebox or stove box, with attachable legs and stove pipe. More collapsible than this is asking for trouble. 3. How can I prevent my stove from "burning out"? Burn out means that the bottom of the stove is burned through, or corroded over a period of time. If this gets bad enough, the stove's bottom can collapse and let ash/coals fall out into your tent. Yes, this is a bad thing. The good news is, in over 25 years of making Four Dog stoves, I've never heard of one of my stoves burning out--and I've sold thousands of stoves--so I know you can find a stove that won't burn out. The best ways to prevent burn out are to find a stove designed to take heavy use, handle hot burning temperatures (look to proper gauge selection of metal), and one that has a true airtight door. If the stove you want to buy does not have an airtight door, don't buy it. An airtight door is critical for letting you control the flame, and intensity, of your fire. When you want to slow the fire down, and let it burn low and slow at night, you'll want to have a door that lets you control how much oxygen gets into your stove. Airtight doors also let you control the flame, and heat of your fire, so you don't run the risk of warping your stove. Personally, I have seen very few examples of warping in quality stoves, but many wall tent stoves on the market are poorly crafted--and prone to warping. Titanium is particularly resistant to warping, but even then, your stove should have an airtight door to get peak perfomance. Along with the airtight door, it's important that your tent stove had a damper, so you can choke down the flame, when needed. A damper will make your stove about 15% more efficient, since you can control the burn intensity of it. This means you can save 10-20% on firewood harvesting, and that means less time cutting and hauling wood. That's always a good thing to cut back on--harvesting wood--so think of your damper as an investment in your future time to relax in camp. Some stoves on the market use a double-walled construction, which I have never found necessary for use as a tent stove. If your stove has an airtight door, damper and is properly constructed, you will have no problems with overheating or burn out. That's been my experience with over 25 years of making single-walled stoves, and so far, I've not found the benefit of double-walled stoves, when you consider their added weight and bulk. These are some of the highpoints you'll want to consider, when you start shopping for a new camp stove. Take a look around the website. We have a lot of helpful information here, to help you find a wall tent stove that will work just right for your needs. I'll see you on down the trail!